Acho que as tuas alterações foram muito prespicazes. Ficou linda a saia! Eu gosto muito de este saia, do tecido utilisado, do modelo! Legal! This is super cute, I would've done the same as you with the welts (or removed them altogether. Ótima peça! Parece-me que você prendeu o forro na bainha? isso não repuxa? Oi Cíntia! SIm o forro está preso na bainha, mas tem uma dobra grande... A bainha tem 10cm e o foro tem o comprimento da saia, depois de preso na bainha deixa uma boa dobra que o impede de repuxar. Na foto o forro está passado a ferro, por isso parece que termina sobre a bainha direto, mas não, é uma dobra. Optei por esse acabamento para não ter que rematar o acabamento da saia no avesso; beijinhos! This is the perfect way to do the crop top trend and still look work appropriate! 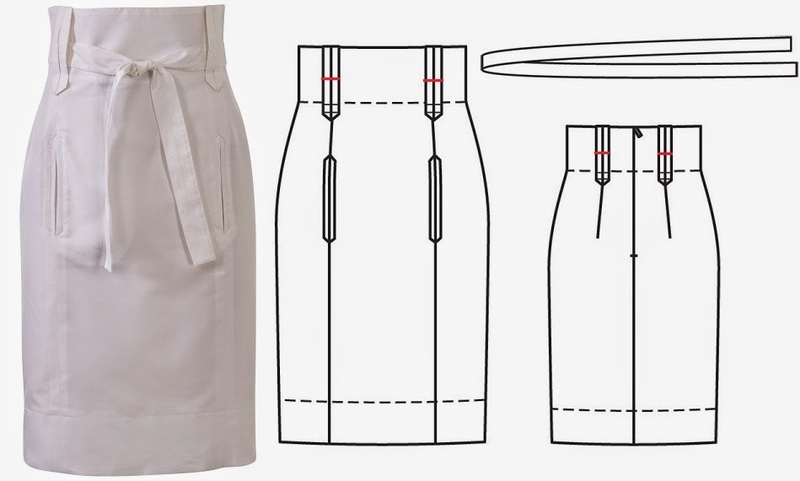 I'm so glad you didn't make the actual welt pockets functional - not sure what Burda was thinking there. This skirt has a lot of fun details. I love it! I thought cotton piqué didn't need to be lined... which fabric did you use for lining it? Hello Esther! I opted for lhe lining because personnaly I prefer my skirts lined. This cotton pique is also very thin and it tends to wrinkle. I used a piece of lining from my stash, I'm not sure of its fiber content but it feels very comfortable and breathable so I'm happy with my choice. Thank you so much for your lovely coment! Great take on the pattern - and, as usually, smart smart alterations. I really like the details of this skirt...very posh. This is so flattering on you, it looks great and I love how you styled it. I think you made a good call on the pockets, it's not like you'd use them for anything there anyway though they do add a nice detail. Tany shall I tell you something, this is a much better workmanship than those around in the shops, you know what I am talking about ;) High quality standard darling. No need to tell ya that I love it! Lovely skirt! It has cute details. Tany! muito obrigada pela atenção. Sempre fico atenta aos seus detalhes que são muito uteis para mim. This is a great looking pencil skirt. Love it belt hoops and the high waist.